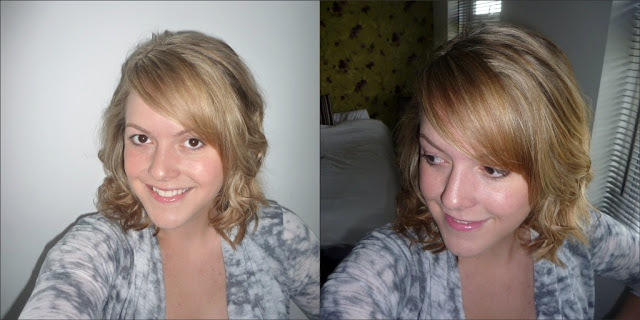 Pretty shocking really, I write a hair blog, but rarely offer up Hair of the Day's. I hope to change that! I went for curls at work today, I tend to wear my hair up a lot whilst working, so it was nice to give it a bit of bounce and some curls. I started by blow drying my hair (adding Aussie Hi-Volume mousse) then used my Babyliss Pro Curling Wand (using heat protection spray from Aussie) along with my Fudge Urban Sea Salt Spray, and finished with some L'Oreal Elnett hairspray. I can confirm no crispy curls here, only soft, gorgeous smelling curls with texture to rival any beach babe. The curling wand has really great staying power, and holds the curl perfectly throughout the day, and I'm totally in love with the Fudge Urban Sea Salt Spray. Honestly, it's amazing. Your hair looks gorgeous, Kel, so soft and natural looking. I bet you'll be wearing it like this on your hols. PS Thanks for the advice about the Spin Pins, I may invest if I spot them in Asda this weekend. It looks so beautiful. Wish my hair held a curl properly!